British sign language is as the name suggests the main form of sign language used in Great Britain. It is not the only form, as some people choose to use American Sign Language and others, and there are also forms of signed English which are used, these are not languages in their own right but more translations of English. British Sign Language (BSL) is, however, a language in its own right. Estimates for the number of ‘speakers’ of BSL vary, but it is known to be the preferred method of communication for the majority of the deaf population in the UK which varies between 70,000 and 250,000. It’s likely that the number of BSL speakers falls into the lower half of the range, but it is still quite a considerable population who speak this language. Many people who are new to British Sign Language make the mistake of assuming the language is a series of gestures which act out the word. This is not the case, as this would be far too complicated and time consuming, not to mention some words being nigh on impossible to act out. In fact, BSL is much more involved and is a language just as English, French and Spanish are languages. It has its own grammar system and its own rules and exceptions. It has its own vocabulary and patterns. The only thing which differentiates BSL from other languages is that it is not spoken. Apart from that it is a language as any other. It does not yet have the same status in this country as Gaelic Welsh and other languages, but campaigners want it given this status because of the numbers of people who ‘speak’ it. BSL is obviously mostly used for deaf people. Deaf people have to be able to learn it without having heard the English translations, so this is another reason why the language completely exists on its own, meaning people who are deaf from birth can understand it. As well as deaf people, the families of deaf people often learn BSL so they can all communicate together. In addition, teachers also sometimes use it so they can communicate with everyone and also teach bits to their pupils in order that they can do this too. 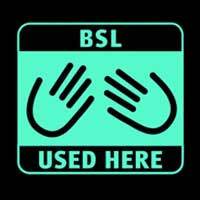 Outside of community units such as these, BSL is often seen in everyday life, most notably on TV. All major TV channels broadcast some of their programmes with a BSL interpreter signing in a corner and with the advent of digital TV it is becoming easier for deaf people to access these. It is preferable to simply watching with subtitles because BSL can convey the emotions of a speaker’s voice in the way that subtitles never could. British Sign Language, like any language, is a useful skill to know. It may not make you quite as attractive to an employer as if you had French or Spanish skills but what it will do, is ensure that you can chat to people you meet if they use BSL. Otherwise, if you meet a deaf person, it can be very frustrating for both of you if you do not speak the same language. Learning BSL takes time and patience but the rewards are endless, and the thrill of communicating words, emotions and feelings through your hands is great. I live in the USA, and have a friend who has a son with a traumatic brain injury.The American sign language does not include Makaton, but some of our signs include body, language similar to Makaton. Could you possibly send me some literature on the Makatonconcept. I am in England until January 1st. I'm afraid we do not hold such information. I have included a link to The Makaton Charity, here which may be able to help you further. We are glad the website is of help.